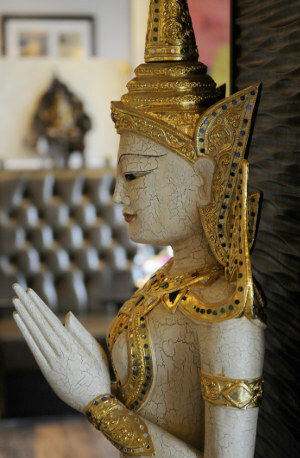 Sukhothai, Headingley, Leeds – Restaurant Review. The student ville version of the four-strong Yorkshire Thai restaurant group have changed their menu – is it still up to the high standards their regulars expect? I am a late adopter of Thai-food indulgence. Only in the last couple of years have I come to my senses and realised what I’d been missing out on, whilst many friends drooled over the mere mention of a Pad Khing, or a Gai Tod Prik Gang. Sukhothai in Headingley has been a fixture of the lively student suburb since 2007. Situated on the corner of St. Anne’s Road and Otley Road, it’s the one of four Sukhothai restaurants that I hadn’t yet experienced. Smaller than it’s City Centre counterpart, as you enter the restaurant there’s no mistaking where you are. Being in student-ville, you could understand if they didn’t put as much passion in to the presentation of this restaurant. A scaled down version perhaps? But that wouldn’t be Sukhothai. Here, it’s pristine. The usual touches of Thai luxury, mirrors and detail are all present and correct. Incredibly well presented, polite staff show that the standards are right up there as they are in their other restaurants. They seem happy to see us, and offer to take our coats as they show us to a table in the window. Now, the Sukhothai menu has always been large and full of favourites. So, when they announced the recent menu change, it caused a few waves. But as our drinks order was taken (two bottles of Chang, please!) any worries drifted away, and we were told it had just been slightly streamlined. With a few new additions to boot. Excellent. That’s great news. But we still hunted down our favourite eats, just to make sure our usual choices survived the cull! So we browse what they have to offer, and I decide on the Khanom Jeeb (£5.95) to start. 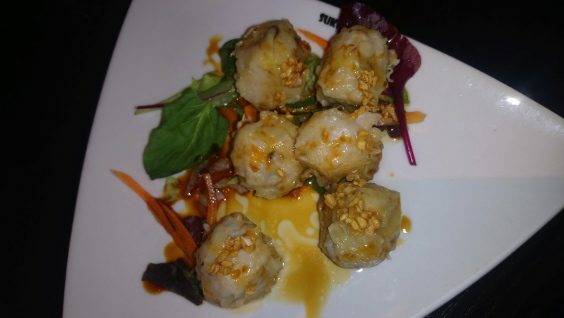 This is steamed pork and prawn dumplings drizzled with sweet soy sauce and topped with crispy garlic. My friend opts for Satay Gai, grilled chicken skewers marinate in Thai herbs, topped with peanut sauce (£6.25). With a portion of what I consider to be the nicest prawn crackers on the planet already on the go, our starters arrive promptly. And in true Sukhothai fashion, they’re beautifully presented and you can see how succulent they are before you tuck in. It’s the first time I’ve had the Khanom Jeeb, and I’m not let down. I couldn’t have imagined that pork and prawn could be binded together to form something that works like this. But work this does. The dumplings are soft and tender, and the sauce, the garlic… I’m glad they serve six as a starter, because I would have eaten any less far too quickly and probably ordered more! The Satay Gai is just as impressive on my friend’s tastebuds, and he says there’s perhaps a reason it’s at number one on the menu. Starters devoured and another bottle of Chang ordered, it’s time for the mains to arrive. Hot plates at the ready, out comes the Pla Choo Chee for my friend, and the Four Seasons Duck for me. 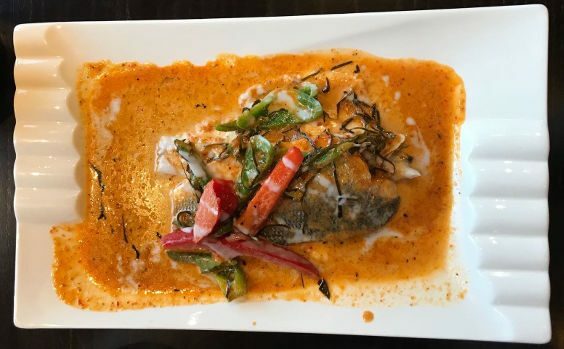 At £15.50, the Pla Choo Chee is a crispy sea bass fillet, in a rich red curry sauce with coconut milk and lime leaves. It’s his first time in trying the dish, steering away from his ‘usual’, and he’s pleased with his choice. He’s now got another favourite dish that he can choose from next time he takes his fiance to the Chapel Allerton restaurant. And me, well… the Four Seasons Duck is absolutely beautiful. For £10.95 I’ve got an aromatic, and slightly spicy dish of roasted sliced duck breast, cooked in a Thai red curry sauce with coconut milk. Tomato, pineapple and grapes complete the serving, and the balance between all the ingredients is perfect. I was introduced to a similar dish to this about 18 months ago (and to that person I will be entirely grateful), but the Sukhothai version is in a league of it’s own. Flavoursome as standard, and the duck succulent and soft. We both have Khao Niew (Thai sticky rice) as a side at £3.25, and as always the staff clear two empty plates from us. We never leave anything for the doggy bag! The evening ends with dessert. Banana in Batter, and Mango Cheesecake stand out to us, and we clear those plates too. It brings to an end a really nice night at Sukhothai, Headingley. Even after a menu change, Sukhothai has still got it. It just continues to serve up the best Thai food going. The Headingley restaurant carries that incredibly high standards of service the food of decor of cleanliness, that Sukhothai is known for. And tonight has just re-affirmed why it’s the name on everybody’s lips when you think about Thai food in Leeds.